In the antebellum years, the Western world's symbolic realities were expanded and challenged as merchant, military, and scientific activity moved into Pacific and Arctic waters. In Antebellum at Sea, Jason Berger explores the roles that early nineteenth-century maritime narratives played in conceptualizing economic and social transitions in the developing global market system and what these chronicles disclose about an era marked by immense change.Focusing on the work of James Fenimore Cooper and Herman Melville, Berger enhances our understanding of how the nineteenth century negotiated its own tenuous progress by portraying how a wide range of maritime stories lays bare disturbing experiences of the new. 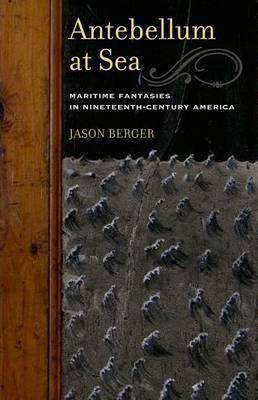 Berger draws on Slavoj Zizek's Lacanian notion of fantasy in order to reconsider the complex way maritime accounts operated in the political landscape of antebellum America, examining topics such as the function of maritime labor know-how within a transformation of scientific knowledge, anxiety produced by conflict between gender-specific and culture-specific forms of enjoyment, and how legal practices illuminate troubling juridical paradoxes at the heart of Polk-era political life.Addressing the ideas of the antebellum age from unexpected and revealing perspectives, Berger calls on the conception of fantasy to consider how antebellum maritime literature disputes conventional views of American history, literature, and national identity.